Lent. It's a time to take distractions away from your life. A time for simple living, prayer and fasting. 40 days to be exact. 40 days to "repent" and re-focus our lives. It's a time to grow closer to God. It's a time to take away the things that are getting in the way of our relationship with Him. 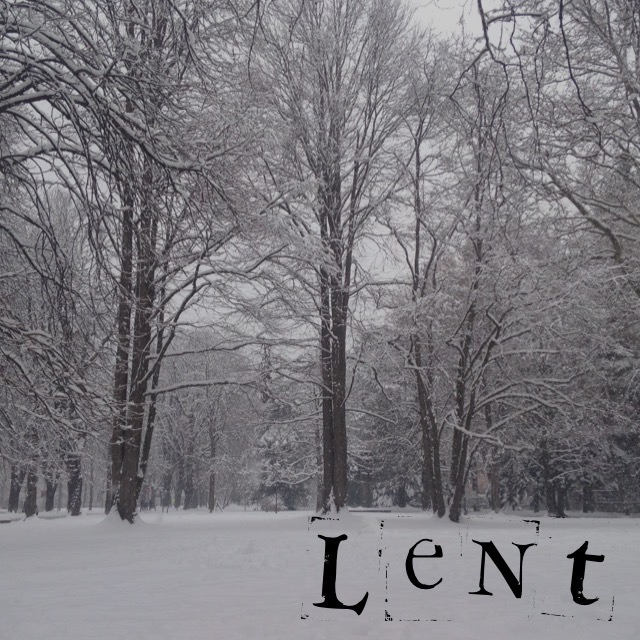 Lent is a trial run to a new lifestyle. Going into Lent this year has weighed heavy on my heart. As I thought and prayed about what I want to give up, I literally couldn't come up with anything that I felt as a struggle to "give up" for 40 days. French fries, maybe? They really are my weakness. I can eat a healthy meal, but put french fries in my face and I'm done for! As I prayed, "Lord, do you want me to give up french fries?" I didn't have clear sign or feeling that this is what he wanted me to do to draw closer to Him. I kept praying. Yesterday, Fat Tuesday, the day I really needed to figure out what I am giving up for 40 days and I am slammed at work, running behind and I can barely breath. I had 5 minutes to sit down, I look at my phone and my best friend Jessica had sent me an article link, "Why you need to know your own soul before you look for a soulmate." I read it and it's a great article. Single, married, young, old, it doesn't matter! Read it. I linked it for you. It's just a push of a button. I call my best friend after work. We chat about the article, what we relate to, what we need to be more mindful of, etc. We can agree that we both are just silly, 20 something year olds that really don't know what love is supposed to look like at this point in our life. I've always been a firm believer in truly loving yourself before being involved in a relationship. I feel that I have done a good job at it. I don't try to "find" a relationship and I definitely don't want a Jerry Maguire, "you complete me" in my life. That's right... Dating. Dating is different for everyone, so let me explain the kind of dating I am talking about. The kind of dating that two people meet socially for companionship, beyond friendship. It's so exciting you take an extra hour to get ready or buy a new outfit. The type of dating that you call your best friend because it was so great, or not so great. The kind that you're hoping for a Goodnight kiss. Someone that you are truly interested in and maybe would go steady with. The kind of dating that could potentially lead to marriage. I am choosing to take dating out of my life because I feel like it is distracting my relationship with God. My most recent ex and I separated just shy of 6 months ago. I wanted zero to do with men when we originally broke up and that still stands true today. Being in a relationship sounds exhausting right now, but honestly, who doesn't love the attention and companionship of someone else? God made us to naturally want companionship, but healthy companionship. With that being said, I have been on a few dates, a friend even convinced me to get on an internet dating site for a hot second. Nothing mind blowing or life changing happened. No wedding bells. Mostly just no connections beyond the normal interaction of two people exchanging a few words. I know in my heart that I don't want to meet "the one" right now, so why am I going on dates and wasting my time and their time? I don't want to give a false impression and awaken someone's feelings without any intentions of reciprocating those feelings. I know what that's like, it's heartbreaking and I do not wish to do that to anyone. It's time for me to re-focus on my career, family, friends, young life and life in general. More importantly, it's time to re-focus on my loving God. I need to grow and pull closer to him. He has graced me with a beautiful life and by focusing on him rather than my marital status, one day, dating won't seem like a chore and this will have been for the right reasons. Now ask yourself, "What I am giving up for Lent?"